It’s not easy to define Richard…he’s a World Record holder in full and half marathons, but he’s also one of the world’s best sprinters – and the current Paralympic and World Champion in the T42 200m. Many people say Richard is an inspiration. Richard says that he’s simply an athlete, who has been given the opportunity to run. 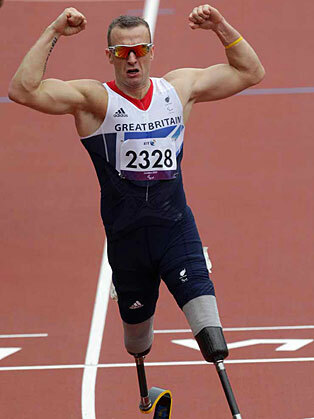 As a double leg amputee, life is full of challenges, but that’s never got in Richard Whitehead’s way…Since that first marathon in 2004, Richard has run more than twenty marathons, not to mention competing at the 2006 Winter Paralympic Games in sledge hockey. In 2009, he became the first leg amputee (single or double) to break the three-hour mark for a marathon, a world record he has now lowered to 2 hours, 42.54 minutes. He also broke the half marathon world record with an incredible run of 1 hour, 14.14 minutes. Richard won Gold in the London 2012 Paralympic Games in the T42 200m, he was second last after the first 100m, but then surged through the field to become the Paralympic Champion with an incredible burst of speed. But aspirations are bigger than just winning races. He wants to make a difference. To prove that even though he has a disability, he has overcome barriers that have been put in front of him. Following gold medals at the IPC World Championships and Anniversary Games (200m T42), Richard has recently completed the challenge of a lifetime – running 40 marathons in 40 days, from John O’Groats to Land’s End. He ran a total of 977 miles for his two chosen charities, Scope and Sarcoma UK. Other than being a professional athlete, Richard is also a director and performance mentor at oneathlete limited. Richard started the business with Tim Stevenson (his Strength and Conditioning coach) and Gemma Telford (a sports physiotherapist) in 2013. The business provides an integrated sports performance support team including strength and conditioning, sports physiotherapy and performance mindset and lifestyle mentoring. In 2014, Richard was also an outstanding contender in the TV competition series ’Splash’, coming runner-up!